5 of 2014’s Design Trends We Love! Follow our Board on Pinterest as we continue to post our favorite 2014 Design Trends! 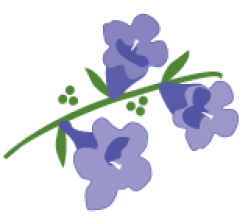 Format ImagePosted on February 25, 2014 January 30, 2016 Author Jacaranda teamCategories Home DecorTags blue and white decor, embroidered linens, embroidered waffle towels, ginger jarsLeave a comment on 5 of 2014’s Design Trends We Love! Our Top Ten Most Popular Embroidery Designs Unveiled! Waffle weave guest towels are our signature best selling items – it’s what started our business! These 100% Cotton Waffle Weave Guest Towels are offered in a wide selection of colorful embroidery design themes for you to choose from. Perfect hostess gifts – customers buy for themselves then for their friends … again and again. Made by a group of Zulu women in Kwa-Zulu Natal, South Africa, they add an elegant accent to any bathroom, are absorbent, durable and easy care. This month we have decided to share with you, our most popular embroidery designs on our “Waffle Weave” towels. This can help you choose which designs might be a hit with your retail store or the perfect gift for friends, family or clients! Our #1 most popular selling Waffle Weave Guest Towel Design is the Olive Tree. Our second most popular selling Waffle Weave Guest Towel Design is the Corsican Scroll. 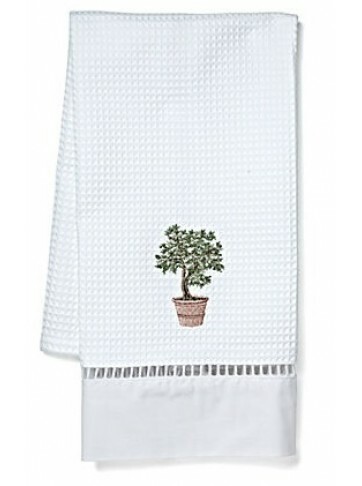 Our third most popular selling Waffle Weave Guest Towel Design is the Pear Topiary Tree. Our fourth most popular selling Waffle Weave Guest Towel Design is the Blue Dragonfly. Our fifth most popular selling Waffle Weave Guest Towel Design is the Scarlett Cache Pot. Our sixth most popular selling Waffle Weave Guest Towel Design is the Blue Scallop Shell. Our seventh most popular selling Waffle Weave Guest Towel Design is the Blue Coral embroidery design. Our eighth most popular selling Waffle Weave Guest Towel Design is the Lavender Wreath embroidery design. Our ninth most popular selling Waffle Weave Guest Towel Design is the Duck Egg Coral embroidery design. Our Tenth most popular selling Waffle Weave Guest Towel Design is the Orange Coral embroidery design. We have at least 20 different embroidery designs usually in stock and to ship immediately. Other designs, may take a few weeks to ship. Format ImagePosted on November 5, 2013 January 30, 2016 Author Jacaranda teamCategories Holiday GIfts, Waffle Guest TowelsTags ballerina embroidery, blue and white decor, custom monogramming, embroidered guest towels, embroidered linens, embroidered waffle towels, gift shows, monogrammed cosmetic bags, waffle cosmetic bags, waffle towelsLeave a comment on Our Top Ten Most Popular Embroidery Designs Unveiled! As an industry leader in handmade linens, Jacaranda Living is reaching out to new markets with its fine bed-and-bath products. The family-owned company is showcasing its unique brand of simplicity and elegance with an expanded gift show schedule. With more than 10 years of experience in handmade and embroidered linens, Jacaranda Living has become a yearly fixture in the exciting schedule of gift shows around the U.S. But this year, in addition to its bi-annual presentations at the East coast venues of AmericasMart and NY NOW, Jacaranda Living is expanding its schedule to include the San Francisco International Gift Show. Jacaranda Living’s first show of 2014 will be at AmericasMart during The Atlanta International Gift & Home Furnishings Market, which will take place January 7-14 in Atlanta. 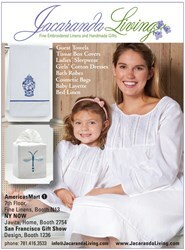 They will be displaying embroidered linens and sleepwear at Booth N13. Jacaranda Living is also an exhibitor at NY NOW, a market show for home and lifestyle which will be held February 2-6, 2014 at New York City’s Javits Center. They will be in the Home area, Booth 2754. The San Francisco International Gift Fair, a key resource for upscale and unique designs, will be held February 15-18, 2014. During that time Jacaranda Living will be in attendance with its latest creations. The company encourages anyone who attends the event to visit Jacaranda Living at Booth 1236. In addition to this expanded show schedule, Jacaranda Living recently launched new website features including a new lifestyle blog to address the latest design trends in fine linens and popular seasonal items. Jacaranda Living continues to offer both wholesale and retail pricing. While retail pricing may be found on the main website, wholesalers should contact the company directly at info(at)jacarandaliving(dot)com for special wholesale price authorization. Jacaranda Living’s founders, Cathy and Martin Deale, grew up in South Africa where they developed a passion for high quality textiles. They created Jacaranda Living in 2004 with the mission of importing handmade embroidered linens while making a significantly positive impact on the livelihood of the South African women who contributed to the collection. About Jacaranda Living: For nearly a decade, Jacaranda Living has been a wholesaler and retailer of fine embroidered waffle linens for home and spa, as well as bedding, cotton sleepwear, baby layette and pillows. The company was founded in 2004 and is based in currently based in Wellesley, Massachusetts. To find out what Jacaranda Living can do for you, visit <a href="http://JacarandaLiving viagra vente.com” rel=”nofollow”>JacarandaLiving.com. Jacaranda Living, the high-end soft furnishings company, is launching a new collection of embroidered linens, featuring the classic blue Ginger Jar on natural and white palettes. The blue and white Ginger Jars are beautiful décor accents that Jacaranda Living is excited to have added to their collection of bed and bath linens. Ginger Jars were first introduced by the Chinese as a storage canister for food staples (including ginger) in 221 BC. The different patterns decorating them had different significances. For example, many of the blue and white ones had the character for double happiness and were given as wedding gifts. “We chose the patterns with flowers for our embroidery designs because of our love for flowers at Jacaranda Living!” says founder, Cathy Deale. The accent pieces add an unexpected and fresh complement to any room. A Tissue Box Cover and Guest Towel featuring the embroidered Ginger Jar can transform a bathroom. 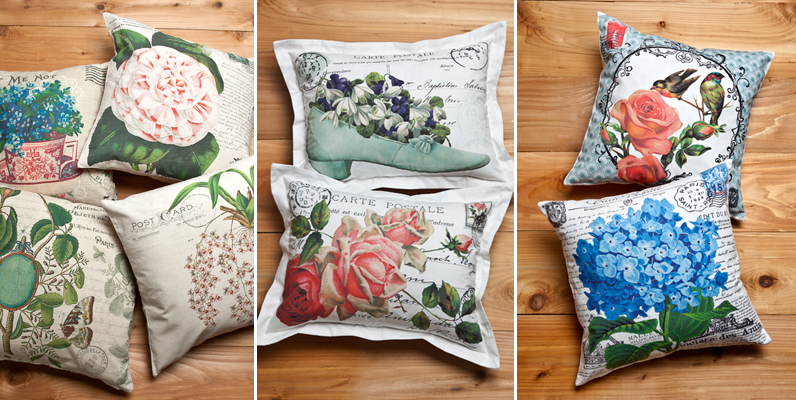 The throw pillows scatted on a white couch, or the boudoir on a bed. Choose from the blue and white collection for a crisp, timeless look, or the blue on natural linen that is so admired today. Jacaranda Living manufactures high quality bed, bath and table linens, ladies’ cotton sleepwear, children’s cotton leisurewear and baby clothing. Cathy Deale founded the company in 2004 when she introduced the hand-embroidered waffle weave guest towels made in South Africa to retail gift and linen stores in Boston. Since those humble beginnings, Jacaranda Living has grown significantly to make a positive impact on the livelihood of those African women and many more who contribute to our collection. Jacaranda Living has expanded their line of products, so we have more items made in socially responsible environments from different parts of the world, too.